Our goal with the unemployment video was to show the high rate of unemployment in South Africa. Unemployment is directly linked to poverty. Our goal was to show how one woman who lives in the township and is unemployed, how she lives and her daily struggles. In the country the huge contrast between rich and poor is so visible and needs serious attention. 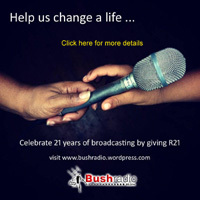 * The short video insert was produced by the trainees in the Bushradio newsroom as part of their training at the station. Besides their radio duties, the volunteer run newsroom is exploring ways to use basic technology to share news content in a converged media environment. The video was shot using a Canon PowerShot A22 camera and edited on Windows Movie Maker.